Below is a letter from a friend, who left the Catholic Church for the Lutheran Church. He didn't agree with the various Catholic teachings concerning Mary. In fact, he claimed that the Catholic Church rewrote the history of Mary and expresses some hostility and anger about what he believed the Catholic Church has done regarding Mary. Among other things he mentions the Immaculate Conception. Although I agreed with him that someone rewrote history concerning Mary; however, it wasn't the Catholic Church who rewrote it. He didn't seem to realize that Martin Luther and other Reformers defended the Immaculate Conception. I wrote him back because I believe his well written letter deserves a response. Unfortunately the Catholic Church can't leave it at that, they have to portray Mary as perfect (as if God cannot work through imperfect vessels). At some point, a Pope declares that Mary was without sin. That sinks it for me. One of the themes of Paul's epistles is that “All Have sinned. All fall short of the glory of God.” Why does the Catholic Church make this claim? Was Mary not human? Lenny, you are probably reading some of the hostility and anger I feel about what I believe the Catholic Church has done regarding Mary. I generally keep these thoughts to myself unless someone asks me (like you did). I am not leading an anti-Mary campaign, but I believe the Catholic Church has done Mary a disservice in proclaiming her without sin... The net result for me is that I would disbelieve anything the Catholic Church proclaims regarding Mary. My thoughts and feelings on this topic are one of the reasons I left the Catholic Church and now worship at a Lutheran church, God bless you Lenny, I look forward to your response. Who rewrote the history of Mary? Non-Catholics teach the deification of Mary. Did Jesus' Mother Mary sin? Young's Concordance, exception to the word "all". Martin Luther speaks for the Immaculate Conception. Song of Songs, no blemish, perfect one. 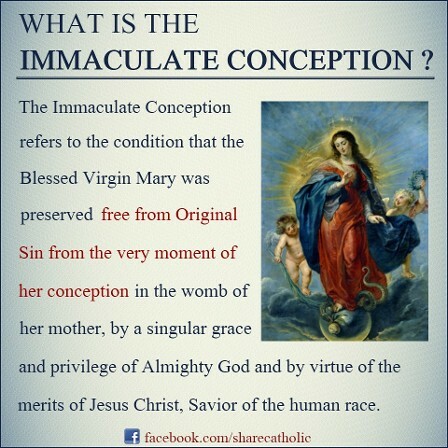 The Immaculate Conception is implicit in Genesis 3:15. Woman without blemish, a perfect one (Song 4:7; 6:9). Augustine believed in the Immaculate Conception? Words, not in the Bible, that most Christians believe. Apparitions and the Immaculate Conception. Lourdes France, the Jewish connection. Mary and the history of the U.S.
Columbus names Islands after Mary. Columbus names 2nd Island after Mary. Jesus honored Mary and we should as well. Thank you for your very candid letter and your excellent questions. The detractors of Mary would see me as wasting my time spending all this effort to speak about the Mother of God rather than speaking about God himself, in the person of Jesus. Why Mary? Isn't Jesus everything? Well, the only thing I have to say about this is that if the detractors of Mary would spend more time on Jesus and less time maligning His mother Mary, then I would have more time to spend on Jesus and so would they. If our lady were to enter Jerusalem today in a golden coach drawn by 4,000 horses it would not be an honor great enough for she who bore in her womb our savior (Protestantism and Our Lady, Fr George Ruler). Some might say that this is a bit much; but then, what would you expect from a Catholic priest? He did stop short of deifying her but, nevertheless, doesn't he almost deify Mary by this extravagant form of high praise? Shouldn't Jesus be given this type of praise instead? Perhaps the person to answer this question would be that very sixteenth century Augustinian Catholic priest who made the statement in the first place. He is none other than Fr. Martin Luther himself. In my opinion, Luther was not too extravagant in his praise of Mary. Martin Luther seems to grasp the fact that God exalts the humble (Lk. 14:11). And Mary is that humble handmaid of the Lord (Lk. 1:38). Who rewrote the history of Mary: John, you suggest that the Catholic Church rewrote the history on Mary. You mention some hostility and anger about what you believe the Catholic Church has done regarding Mary and you mention this is one of the reasons that you left the Catholic Church and now worship in the Lutheran Church. I can understand your anger because I am angry about the rewriting of the history of Mary as well. The only question that I pose for you is this, who rewrote the history of Mary and when did it happen? Most of the rewriting did not take place at the time of the Protestant reformers. It took place later and some Catholic teachings about Mary still exist in Protestant Christianity today. As I have already shown, Luther held Mary in extremely high regard and so did the other Reformers. An Anglican who later converted to Catholicism had this to say about the Reformers and Mary. Zwingli had no great difficulty with honor to our Lady. He tried to define it in ways peculiar to himself but he did not deny her central place in salvation history. Luther spoke in a most extravagant way to modern Protestant ears. He maintained for a long time devotion to the Immaculate Heart. He kept liturgical Marian feasts such as the Annunciation. Calvin was a little more cautious, but he himself spoke of the Son when he spoke of his Mother in heaven. They understood that theological words meant something. They understood that the council of Ephesus was an ecumenical council; that the definition of the Theotokus [Mother of God] meant something Important. (Protestantism and Our Lady, Fr George Rutler). John, you say, The net result for me is that I would disbelieve anything the Catholic Church proclaims regarding Mary. 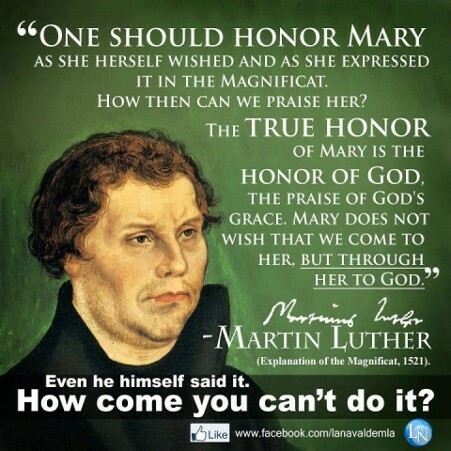 All I would ask of you is this; since you worship at a Lutheran Church now, would you believe anything that Martin Luther proclaims regarding Mary? For example, would you believe that Luther was right when he kept for a long time, a devotion to the Immaculate Heart of Mary? Would you believe Luther was right to keep certain Marian liturgical feasts such as the Annunciation? And would you disbelieve Luther when he said: If our lady were to enter Jerusalem today in a golden coach drawn by 4,000 horses it would not be an honor great enough for she who bore in her womb our savior? Would you say to Luther, I don't know why you put all this emphasis on Mary. After all, Scripture says, 'Jesus is the way, the truth, and the life' (Jn. 14:6), not Mary. You said, I am left to speculate about why the Catholic Church almost deified her. Would you also speculate on why Martin Luther almost deified her? And you can say, but, he didn't deify her, he was only honoring her, and I would only agree. Luther was in fact honoring her and that is what the Catholic Church continues to do today. I have come to realize that among the many historical teachings of the Church some of the most difficult for Protestants are the various teachings regarding Mary. I have heard it said You just don't know how difficult it is for Protestants to accept Mary. However, it was not always that way, as I have already shown with the extremely high regard shown by Luther and others towards Mary. Of the Ninety-five Theses that Luther nailed to the door of the Wittenburg Church (31 October, 1517), none list Mary. I should point out again that all of the Protestant Reformers as well as the Anabaptists at that time were originally Catholics and so they would have received basically the same teachings about Mary. There is no record of a council among the various Protestant groups saying this is what we are going to continue to believe about Mary and this is what we are going to relinquish. It was a gradual development that took place over a period of many years, for these Marian teachings to fall by the wayside. And of course some of these teachings such as the Virgin birth were never lost. John, getting back to your letter you say, It seems to me that the Catholic Church rewrote the history of Mary, and you speak of some of the hostility and anger you feel about what you believe the Catholic Church has done regarding Mary. As you can see the rewriting of the history and beliefs about Mary were not accomplished at the hands of the Catholic Church, and most of it was not at the hands of Martin Luther or the other early Protestant Reformers. The seven books in the Old Testament that were in Luther's Bible and the early King James Bible were removed from later Protestant Bibles after 1828. And just as there was a removal of these books, there was also a gradual removal of Marian beliefs that were held by Luther and others. So the rewriting of Mary was a gradual progression and many people were involved over several generations. Non-Catholics teach the deification of Mary: It comes as quite a surprise to some Protestants when they realize that the concept of Mary as God, or the deifying of Mary, is not a Catholic concept at all, but in fact one of the Protestant teachings. Sometimes Protestants look at me in dismay as though, how dare you make such a statement. Nevertheless, it is true; there is no council or teaching in the Catholic Church (East or West), from the Apostles to the present that teaches Mary is God. The teaching that Mary is God or equal to God is a Protestant teaching (or misrepresentation) about Catholicism. This teaching is kept alive by Protestant publications such as, The Evangelist: 'Catholics are taught that Mary is to be given a worship that is equal to God.' Of course, this type of literature is not just Protestant, it is also anti-Catholic because it is a blatant misrepresentation of Catholic Church teaching. In fairness to many if not most Protestants, this type of literature is an embarrassment, just as anti-Protestant literature that misrepresents a particular Protestant Church would be an embarrassment to most Catholics. The anti-Catholics are doing a great disservice to the Body of Christ because their untruthful tactics are dividing Christians. They misrepresent the teachings of the Catholic Church and then they disagree not with the Church's actual teaching, but with their own misrepresentations. Well, who wouldn't disagree with those? Did Jesus' Mother Mary sin? : John, you mention that At some point, a Pope declares that Mary was without sin. That sinks it for me. One of the themes of Paul's epistles is that 'All have sinned. All fall short of the Glory of God' (Rom. 3:23). Why does the Catholic Church makes this claim? First of all, you are making an assumption that the use of the word "all" in a text eliminates any exceptions. If you mean by this that "all" have committed one or more sins, no Christian believes that, not even you. This is because an unborn child or infant cannot commit a sin before the age of reason. So already here we have an exception. If the word "all" means there can be no exceptions, then you can come up with some very strange conclusions based on Scripture. For example it says: They did not know until the flood came and carried them all away (Mt. 24:39). Verse 39 does not list any exceptions to all. However, not all living creatures were carried away by the flood to their death. We know that Noah and his extended family survived (Gen. 6:39, Mt. 24:38). If you were to take the word "all" to mean there could be absolutely no exceptions, you could conclude, erroneously that Matthew 24:39 is wrong. You could simply say, that sinks it for me, and throw out Matthew's Gospel. You could also do the same thing with countless other Scriptures and reduce the Bible to nothing. When the anti-Catholics use the word "all" in Romans 3:23 to try to make Mary's absence of sin appear unbiblical they are using it in a very restrictive sense without acknowledging that it can be used in other ways. They are making the same mistake that Jehovah Witnesses make. For example, in the case of the word "hell" the Witnesses will acknowledge some definitions of hell while excluding a definition that does not coincide with their theology. By using this technique the Witnesses can deny the existence of hell. Young's Concordance, exceptions to the word ALL: We found that we cannot use the word "all" in all have sinned too necessarily mean every single individual without exception because this would contradict Scripture which does give exceptions to the word "all". In Young's Analytical Concordance to the Bible (a Protestant Concordance), it says; The word MANY is frequently used for ALL --- The word SOME is frequently used for ALL --- Some articles such as ALL are frequently used for SOME or MOST (Young's Concordance to the Bible Hints and Helps to Bible Interpretation, Robert Young, 1970, William B. Erdmans Publishing Company). When you say, at some point, a Pope declares that Mary was without sin, you are referring to the Immaculate Conception officially declared in 1854. The most holy Virgin Mary was, in the first moment of her conception, by a unique gift of grace and privilege of almighty God in view of the merits of Jesus Christ the Redeemer of mankind, preserved free from all stain of original sin. Some objections to this are that this is not in Scripture and that it was newly invented or not believed prior to 1854. One author puts this under the heading of, The gradual development of Roman Catholic errors (The Bible and Roman Catholicism) and makes no mention of this existing prior to 1854. By not mentioning the fact that the Immaculate Conception was believed before 1854, it is easy to convince people that it did not exist in the Church prior to this time. All have sinned and fall short of the glory of God: The righteousness of God through faith in Jesus Christ for all who believe. For there is no distinction, since all have sinned and fall short of the glory of God; they are now justified by his grace as a gift, through the redemption that is in Christ Jesus (Rm 3:22-24). There are people who will quote the verse, all have sinned and then use this verse against Mary and her Immaculate Conception, because we say Mary was and is without sin. At this point, ask these same people WHY this particular verse is in Romans at this time. Usually, you will hear the sound of silence because very few people know the answer to this question. Even the people who have this verse memorized cannot answer this question. And when they can't answer this question they are admitting they don't know the context; therefore it is very probable that some people might be using this verse out of context. I am going first to the larger context because the same issue being dealt with in Romans 3 is also dealt with in other places. In Acts Chapter 15, (the Jerusalem Council), there were people from Judea suggesting that the Gentiles must be circumcised in order to be saved. Paul and Barnabas went up to the apostles and elders to discuss the question. Peter spoke against circumcision; Now therefore why are you putting God to the test by placing on the neck of the disciples a yoke that neither our ancestors nor we have been able to bear (Acts 15:10-11)? And so the issue was settled once and for all and for all time and this is why today in Christianity we don't require circumcision. However, the controversy did not go away because there were still Jews, who were insisting on it. In fact, so large was the issue that Paul had Timothy circumcised to make it easier to work among the Jews; He took him and had him circumcised because of the Jews (Acts 16:3). The Jews were making a distinction between themselves and Gentiles over the issue of circumcision. In cleansing their hearts by faith he has made no DISTINCTION between them [Gentiles] and us [Jews] (Acts 15:9). In the book of Romans, Paul was dealing with the old Law (circumcision) and was insisting that physical circumcision is not necessary. What is needed is circumcision of the heart; Rather, a person is a Jew who is one inwardly, and real circumcision is a matter of the heart—it is spiritual and not literal. (Rm 2:26, 29). The Jews were pointing the fingers at the Gentiles because they were not circumcised. Paul's mission in Romans Chapters 1 through 3 is to show that Jews and Gentiles are equals, both Jews and Gentiles have sinned, not just the Gentiles. Paul includes the Gentiles, insisting that God shows no partiality. The power of God for salvation to everyone who has faith, to the Jew first and also to the Greek (Rom 1:16). The Jew first and also the Greek, but glory and honor and peace for everyone who does good, the Jew first and also the Greek. For God shows no partiality (Rm 2:9-11). For, as it is written, 'The name of God is blasphemed among the Gentiles because of you' (Rm 2:24). Paul defends the Gentiles, So, if those who are uncircumcised [Gentiles] keep the requirements of the law, will not their uncircumcision be regarded as circumcision (Rm 2:26). Or is God the God of Jews only? Is he not the God of Gentiles also? Yes, of Gentiles also (Rom 3:29). Paul is making the point that, because of you [Jews] the name of God is reviled among the Gentiles. Peter says, In cleansing their hearts by faith he [God] has made no DISTINCTION between them [gentiles] and us [Jews] (Acts 15:9). And it is in this setting or context that Paul says in Romans. For there is no DISTINCTION, since all have sinned and fall short of the glory of God (Rm 3:22-23). WHY was Paul making this distinction at this time? It was because of the animosity that the Jews were showing the Gentiles (Rm 2:24). So when Paul makes the statement all have sinned, he is in effect saying the Gentiles are not the only ones who have sinned, the Jews have sinned as well. Paul goes after the Jews, specifically the ones insisting on circumcision and questions them about their own sin, While you preach against stealing, do you steal? You that forbid adultery, do you commit adultery? You that abhor idols, do you rob temples? You that boast in the law, do you dishonor God by breaking the law (Rm 2:21-24)? Yes, they do quote the words all have sinned as a reason why Mary could not have been Immaculate. However, in doing so they are using these words out of context. Was Mary or someone else claiming to be without sin and then Paul responded to them by saying, all have sinned? No, they were not. Claiming that all have sinned and putting this on Mary is doing harm to the context because the word "all" in all have sinned actually means that both the Jews and Gentiles have sinned and God is showing no partiality. Anabaptist, Balthazar Hubmaier: However, it was believed prior to this; in fact, some of the Protestants of the sixteenth century believed in the, Immaculate Conception. Balthazar Hubmaier, one of the Anabaptists, wrote this: She is and always was pure and unspotted, and Mary is the Mother of God (Hubmaier, pg 231, Vedder). Luther, I already mentioned, maintained for a long time devotion to the Immaculate Heart. There is an obvious question here. Why did this Anabaptist speak for the Immaculate conception while Baptists of today speak against it. It must be remembered that the Anabaptists were all Catholic and their issue was the rejection of infant Baptism. Again, the Marian teachings were not discarded till a later. Martin Luther speaks for the Immaculate Conception: John, I understand that your local Lutheran Church rejects the Immaculate conception; however, Martin Luther spoke for the Immaculate conception. The infusion of Mary's soul was effected without original sin... from the first moment she began to live she was free from all sin ('The Catholic answer' Volume 6 Number 6, January February 1993, Article: The real Martin Luther, Sermon: 'On the day of the conception of the Mother of God,' 1527; pg.35, Dave Armstrong (a convert from evangelicalism). St. Ephraim 370 A.D: We can go back still further to St. Ephraim (370 A.D.): You alone and your mother [Mary], are more beautiful than any others. For there is no blemish in you, nor any stains upon your mother. Who of my children can compare in beauty to these (The Faith of the Early Fathers, pg. 313, Jurgens). A person without stain is immaculate. Song of Songs, no blemish, perfect one: St. Ephraim is not the only one who speaks of a woman who is more beautiful than the others and without any stains. There is a woman without blemish in the Scriptures; O most beautiful among women (Song 6:1); You are all-beautiful, my beloved, and there is no blemish in you (Song. 4:7); One alone is my dove, my perfect one (Song 6:9). How can this be? Doesn't the book of Romans say that They all are under the dominion of sin; all have gone astray; all alike are worthless; all have sinned (Rm. 3:9,12,23). Here we have one who is all-beautiful, without blemish, and perfect. And because all this is true, we have another exception to All have sinned. Who is this woman who is immaculate without sin? An individual trying to make a case against Mary and the Church, maintained that Jesus always referred to His mother as woman and cited John 2:15 and John 19:25-28. He was right about this. In fact, the first time we hear of Mary in the Bible, she is referred to as woman. I will put enmity between you and the woman, and between your offspring and hers; he will strike at your head, while you strike at his heel (Gn. 3:15). The woman’s offspring is prophetic and is the first promise of a Redeemer for fallen mankind. Jesus was and is the fulfillment of that promise. The woman in Genesis 3:15 is referred to as Eve; Jesus is in fact the distant offspring of Eve, the mother of all the living (Gn 3:20). And Genesis 3:15 is also Mary, because Jesus is the immediate offspring of Mary. This is why we call Mary, the New Eve. Jesus was the divine person, who became flesh without sin. The Immaculate Conception is implicit in Genesis 3:15, because the enmity that is between the devil and Jesus is also between the devil and the woman. I will put enmity between you and the woman (Gn 3:15). And because the first Adam and Eve sinned, there was a need for a second Adam and Eve who wouldn't sin. We find the second Adam spoken of in 1 Corinthians. He is referred to as a life-giving spirit. The first man Adam became a living being; the last Adam [Jesus] became a life-giving spirit (1 Cor. 15:45-49). The last Adam, Jesus came into this world without sin just as the first Adam did; however, the last Adam [Jesus] did not sin. The first Eve came into being without sin and later sinned. The 2nd Eve (Mary), like the first came into being without sin. Although the first Eve sinned later; the 2nd Eve Mary did not sin. The first Eve is referred to as WOMAN in all of Genesis and Adam names her Eve in verse 20, because she becomes the mother of all the living (Gn 3:20). Just as the first Eve is referred to as WOMAN. We now have a new Eve in the person of Mary, who Jesus calls WOMAN. She is the last Eve just as Jesus is the last Adam. The first Eve brought sin into the world, and the new Eve brought Jesus into the world as a remedy for that sin. The new Eve coming into existence without any blemish is what we mean by the Immaculate Conception. No sin touched Mary, not even the original sin of the first Eve. Mary needs a Savior: Now the problem for the detractors of Mary isn't so much that Mary is the new Eve, but that she came into being without sin. They will point out that Mary, too, needs a savior: My spirit rejoices in God My Savior (Lk 1:47). The detractors of the Church reason that if Mary does not have sin, then she doesn't need a savior to redeem her from sin. And yet Mary admits that she does need a savior, and so they believe that the Immaculate Conception is in opposition to Scripture. Of course, no one claims that Mary doesn't need a savior; she does need one, and that Savior is Jesus. Boettner quotes Luke 1:47 and says, for in those words she confessed that she does need a savior (Roman Catholicism pg.159). He is right about part of his statement because Mary admits her need for a savior. However, Mary does not confess that she was a sinner. This is simply Boettners tradition added to God's Word. The first Eve sinned, and Genesis Chapter 3 goes into detail about how that sin happened; so we believe she did sin. But the Bible does not say anywhere that this new Eve (Mary) sinned. We should not confuse the two Eves. The first Eve brought sin into the world and the new Eve (Mary) brought Jesus into the world as a remedy for that sin. Mary as a sinner is not anywhere in Scripture. It is something that Boettner and others add to the Scripture. They attempt this by using Scriptures such as Romans 3:23, all have sinned and a little faulty reasoning. They use the word "all" in its most exclusive sense to mean without exception, ignoring the fact that the use of the word "all" does not prohibit exceptions such as in Mathew. The flood came and carried them all away (Mt 24:39). If I use the word "all" in this case to mean without exception, then I am denying that Noah and his family survived. Even though there is nothing in Scripture that says Mary actually sinned, the detractors of Mary reason that if she did not sin, and was conceived without sin, she would not have needed a savior. This type of reasoning comes from their tradition, not the Bible, not the Protestant Reformers and not the early Church Fathers. Woman without blemish, a perfect one (Song 4:7; 6:9): In order to take Scripture in proper context, I must take them in consideration with the whole of Scripture. If I take Romans 3:23, All have sinned, in its most exclusive sense to mean without exception, then, I am contradicting the Song of Songs. I can no longer speak of a woman who has no blemish (Song 4:7) and who is God's perfect one (Song 6:9). She is either without blemish and perfect or she is a sinner who is imperfect. She is not both. The only way out of this dilemma is to recognize that there is an exception and that exception is Mary. She is the only person of whom it can be said: O most beautiful among women (Song 6:1). Please note that Song of Songs 4:7 is applied to Mary especially in the feast of the Immaculate Conception. Augustine believed in the Immaculate Conception: Boettner says "Augustine, who died in 430 A.D., and who was admittedly the greatest theologian of the ancient church, contradicts the idea of the immaculate conception" (Roman Catholicism 160). Boettner is not correct in his statement; In fact, the converse is true. Augustine identified Mary as the exception to the rule about universal sinfulness. This statement, coming as it did from the one who had definitively formulated the doctrine of original sin, appeared to clinch the argument for the original sin, and appeared to clinch the argument for the Immaculate Conception (Reformation of Church and Dogma, Vol. 4, pg. 45). For my part, I would not believe the Gospel except as moved by the authority of the Catholic Church (Reformation of Church and Dogma, Vol. 4, pg. 265). Luther and Zwingli also agreed with Augustine's statement. The Protestant Reformers agreed with Augustine because they were acknowledging that the early Church had to determine the difference between authentic and inauthentic Scriptures. Luther used Augustine's statement to support the Protestant doctrine of sola Scriptura and the Catholic Church used Augustine's statement to defend the Bible based on the authority of the Catholic Church. Words, not in the Bible, that most Christians believe: Getting back to the issue of the Immaculate Conception one of the most frequent arguments against it is also one of the most superficial. There are people who argue that since the words Immaculate Conception are not in the Bible it is not Biblical. Most Christians do believe in some Catholic concepts that are not in the Bible. For example the word Trinity and three persons in one God are not in the Bible and yet Christians believe this. The words two natures of Christ and Jesus Christ fully God and fully man are not in the Bible and yet most non-Catholics believe this as well. Those people who do not accept the Immaculate Conception because the words are not explicitly in the Bible are no different than the Jehovah Witnesses who do not believe in the Holy Trinity because they can't find those words explicitly in the Bible. It is interesting to note that the doctrine of Trinity and the two natures of Christ survived the Protestant Reformation and many of the Marian teachings survived the earlier part of the Reformation only to be discarded in later generations. Lourdes France,the Jewish connection: In 1858 in Lourdes France, Mary appeared to Bernadette Soubirous, and identified herself as the Immaculate Conception. When Mary appeared to Bernadette, she was wearing St. Catherine's medal. In the next century a Jew by the name of Franz Werfel, who was escaping Nazi Germany, passed through Lourdes. He was so impressed with the story of Lourdes, that he wrote a book called, The Song of Bernadette. The book was later made into a movie. Fatima Portugal: Mary appeared in 1917 with a rosary in her hands to three children in Fatima, Portugal. She said among many other things that, Jesus wishes to make use of you to have me acknowledged and loved. He wishes to establish in this world devotion to my Immaculate Heart. Columbus names Islands after Mary: In Samuel Elliot Morrison's book; Christopher Columbus named so many islands after titles given to Mary that he calls one chapter of his book Many Marys. He calls another chapter Virgins and Saints. Columbus before setting sail, made his communion at St. George's Palos, in the small flagship before dawn, and 'IN THE NAME OF JESUS' gave the command to get under way (Admiral of the Ocean A life of Christopher Columbus, pg. 158, Samuel Eliot Morrison, copyright 1942 renewed 1970, Little, Brown & Company, Canada). Columbus names his 2nd Island discovery after the Immaculate Conception: The three ships that sailed were the Nina, the Pinta, and his flagship the Santa Maria. The first land that Columbus sighted was one of the Bahamas. Columbus named this island after our Lord and Savior, San Salvador. The second island that Columbus sighted was named 'Santa Maria de la Conception' after a doctrine to which he was devoted, the 'Immaculate Conception' of the Virgin. The modern name Is 'Rum Cay' (Ibid, pg 239). Columbus's flagship was initially called La Gallega (the woman of Galicia). He changed the name of the ship to Santa Maria (Saint Mary). In honor of the Mother of Jesus. After all, it would be a ship destined to carry the good news of our Savior to the foreign shores. It deserves a name which fitted its noble purposes (Christopher Columbus, Adventurer of faith and Courage, pg. 49, Bennie Rhodes, copyright 1976 by Mott Media, 1000 E. Huron, Milford Michigan). American history rewritten: It can be said that Columbus, like Martin Luther had a devotion to our Lady that surpasses that of many Christians today. It is true that many Protestants have a great deal of difficulty today with the various teachings involving Mary. However, there is a growing number of Protestant authors that have transcended this difficulty and acknowledge the Christian vision and commitment of people like Columbus. Some of the greatest defenders of Columbus are Protestant authors who go out of their way to emphasize Columbus' deep faith in God. Here is a quotation of one of the defenders of Columbus, Catherine Millard. Not many people are aware of Christopher Columbus' deep faith in God and His Son, Jesus Christ. Furthermore, not many people realize that it was his faith that was the impetus that initiated his whole voyage. Columbus wrote a book entitled Book of Prophecies, in which he copied down Scripture pertaining to bringing the Gospel to unknown coast lands (The rewriting of Americas History pg 2, Catherine Millard, copyright 1991, Horizon House Publishers, 3825 Hartzdale Drive, Camp Hill, PA 17011). Millard, in her book, documents the fact that much of America's history has been rewritten and this includes the history of Columbus. The most important aspect of his life - his Christianity is never mentioned (Ibid). John, you mention that the history of Mary has been rewritten, but as you can see, this is not the only history that was rewritten. Mary's history was not rewritten by the Catholic Church, Martin Luther, or Christopher Columbus. There are many groups who are antagonistic to the Catholic Church. They, along with their predecessors, rewrote the history of Mary. You cannot separate Mary from the Church any more than you can separate Jesus from the Church. So when these groups put out their misleading information against the Church, Mary becomes a necessary victim as well. Mary is the Mother of the Church because she is the Mother of the founder (Jesus) of the Church. And because we are brothers and sisters of Christ, Mary is also our mother. I believe it is important to study the history of the Church in order to recover an orthodox understanding of Mary, who is very much a part of Scripture. I realize that there will be people who will resist being told to study the history of the Church, saying that the Bible Alone is their guide; however, Scripture does speak of the Church of the living God, the pillar and foundation of truth (1 Tim. 3:15). If we believe the Bible when it talks about this Church as being the pillar and foundation of truth, then we must go to this same Church of the living God to discover this truth. And of course the Bible is part of this same truth. People who want to deny this foundation of truth are simply denying part of Scripture for the sake of their own man-made traditions. Jesus honored Mary and we should as well: People who leave out the Scriptures concerning Mary are again coming from their own man-made traditions because the Scriptures say; All Scripture is inspired by God and is useful for teaching, for refutation, for correction, and for training in righteousness, so that one who belongs to God may be competent, equipped for every good work (2 Tim. 3:16). So we must not leave out the Scripture verses having to do with Mary or study them with the intent of trying to explain Mary away or dismissing her. The Bible does not dismiss her. Jesus did not dismiss her but honored her with performing His first public miracle at her request at the wedding feast of Cana. If Jesus honored her, then we, in imitation of Jesus, honor her as well. Summary: In summary, I would like to say Martin Luther honored Mary. The Catholic Church didn't deify her and neither did Martin Luther. The Reformers, especially Martin Luther, spoke of Mary in extravagant ways and spoke in favor of the Immaculate Conception. The Catholic Church did not rewrite the history of Mary. It can be said that the Reformers began this process; however, it was not completed in their life time. And still some of the Marian teachings survived in Protestantism. Columbus changed the name of his flag ship to Santa Maria. The first Island he discovered was named after our Lord and Savior and the second Island was named after the Immaculate Conception of Mary. Mary as a God is not a Catholic teaching but one of the Protestant teachings. There are notable exceptions to all in the verse, All have sinned. We hear mention of Mary without stain among the early Fathers. We have a woman without blemish, most beautiful, God's perfect one, in the Song of Songs. This woman is an exception to All have sinned. Mary is the woman referred to in Genesis 3:15. And the enmity that is between Jesus and the devil is also between the woman and the devil. We should not confuse the two Eves! The first Eve brought sin into the world and the new Eve brought Jesus into the world as a remedy for that sin. Mary does need a savior just as you and I do. The words Immaculate Conception and Trinity are not in the Bible; however the concepts are. We should go to the Church of the living God (1 Tim. 3:15) to discover truth, and much of that same truth is in the Bible.